UPDATE: The road reopened Wednesday morning. 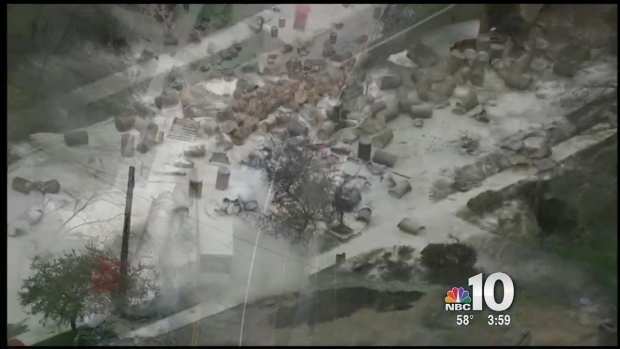 Crews reopened a Montgomery County road Wednesday morning -- days after a deadly and fiery crash claimed a truck driver's life and knocked out power to dozens of homes. A tractor-trailer carrying cosmetic powder and a tanker truck carrying raw sewage burst into flames after colliding head-on along South Park Avenue near Crawford Road in Audubon, Pennsylvania shortly before 6 a.m. Monday, said county dispatchers. A big rig hauling makeup supplies crashed into a tanker filled with sewage resulting in a deadly crash. NBC10's Tim Furlong is in Montgomery County with more. 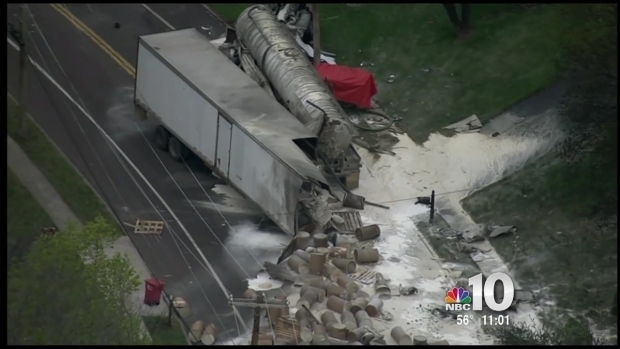 "It was observed that the two tractor-trailers had collided in a head-on matter, causing one of the trailers to split open and discharging containers containing a white powder onto the roadway," said Lower Providence Township Police Chief Francis Carroll. On Tuesday, Carroll identified the driver of the tanker truck as 40-year-old Jermon Jeffers, of Stowe, Pennsylvania. The impact badly damaged the tanker truck cab, causing Jeffers to become trapped. Jeffers died from blunt force trauma, ruled the Montgomery County Coroner's Office. The semi-truck driver escaped uninjured. Early Wednesday morning, crews reopened South Park Avenue, however officials warn the road is unpaved so drivers should take caution. Electrical service was cut off to homes on the 700 block and 800 block of South Park Avenue due to a concern that static electricity emanating from high voltage lines would interact with the powder. Crews removed both trucks shortly after midnight and restored power to residents around 2:30 a.m. Tuesday. Investigators said that the Aqua Pennsylvania tanker carried sewage while the tractor-trailer carried barrels of AquaBeads 519, a white powder and smoothing agent used in makeup. While the substance is not hazardous, it may cause breathing difficulties if inhaled. One person died after two trucks collided head-on along a stretch of road that has had several accidents in the past. It also left a waxy mess along Park Avenue. Crews from PennDOT and Reading, Pennsylvania-based Elk Environmental then used power washing, scrubbing and vacuums to clear the roadway. "This has been a very, very challenging issue to address, with respect to the safe removal of this product from the roadway," said Carroll. "Our ultimate objective" is to get the roadway to a safe place," said Carroll. "PennDOT is going to undertake the milling of approximately 1,000 feet of the roadway in a section between Jode Road and Eagleville Road on Park Avenue," he said. The hope is to reopen the road by 6 a.m. Wednesday. One person died after a tractor-trailer collided with a tanker ruck in Lower Providence Township Monday morning, spilling cargo all over S Park Avenue. The investigation continued and no charges were filed Tuesday. Accident reconstructionists needed the roadway cleared to try and figure out what led to the wreck. A spokesperson for Aqua released a statement on Jeffers' death. Aqua employees are deeply saddened by this tragic loss and send their prayers and thoughts to the employee’s family and friends.